The A1 Basics Skype class is certified by the Ministry of Education in Luxembourg and qualifies for the 24 hours of Luxembourgish lessons needed to receive the Luxembourgish nationality if you've lived in Luxembourg for at least 20 years. This class also qualifies for a refund of up to 750€ for Luxembourgish lessons from the Justice Ministry in Luxembourg for students who have passed the Sproochentest or received citizenship after 24 hours of lessons. This is an absolute beginner’s class based on the Learn Luxembourgish book. How do I know this class is for me: If you don't know any Luxembourgish words yet and have no idea how to construct a Luxembourgish sentence, this class is for you. How is the class taught: The class takes place online through Skype once a week for 8 weeks in a row. Each lesson is 60 minutes long and is taught in English. After each lesson you will have access to online notes that summarize the activities of that day’s class. How much work is involved: Our goal at Learn Luxembourgish is to advance you in your language learning as quickly as possible, so you will have one class per week and in between classes you will be given preparation material for the next class. How many people are in each class: We have several options for the number of students in each class. 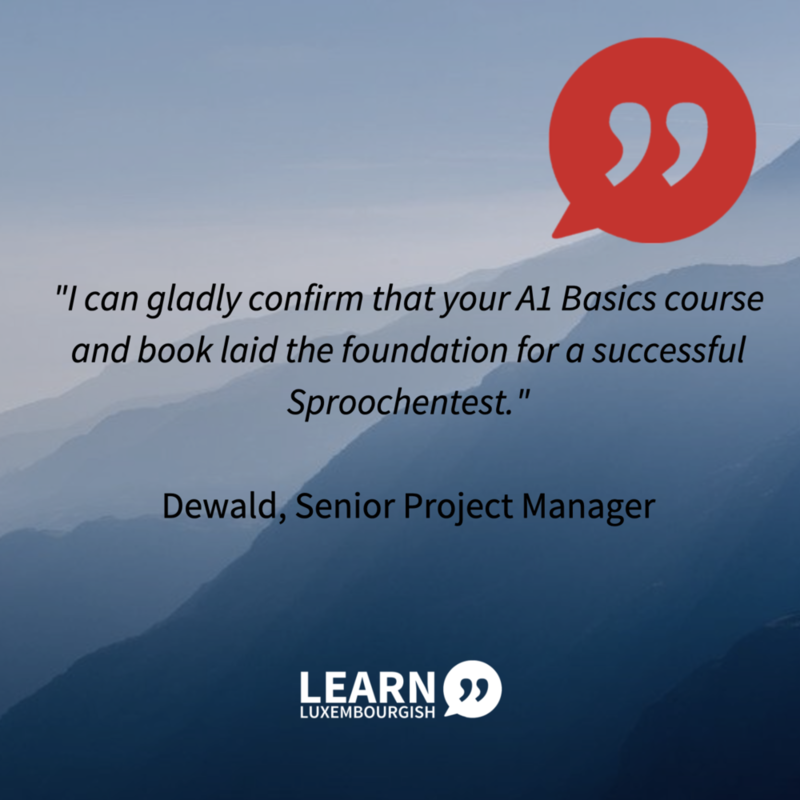 What is the progression of the course: Each week, participants study one chapter of the Learn Luxembourgish book (available online here, or in book stores in Luxembourg). As a group on Skype you will review the most important grammar/vocabulary topics and get a chance to speak and practise the material learned in that chapter. Participants learn how to form their own basic sentences to communicate at an A1 level for all 8 book topics (which are also the topics of the A1 level as defined by the Common European Framework of Reference for Languages). What are the topics covered in the course: greeting someone, and making basic small talk; introducing yourself and someone else; telling someone more about yourself; describing a person or a thing; talking about your job and daily routine; talking about your recreational activities and making appointments; asking for something; situating yourself and asking for directions. This class creates awareness of how the Luxembourgish language works and provides a first introduction. FAQ - What if you miss a lesson? Some people are able to join the class even when traveling for work or for pleasure as all you need is an Internet connection and a computer or tablet. Sometimes people only connect on Skype through a mobile phone to listen to the class if they don't have a computer to access the virtual classroom. Our policy is that missed classes cannot be rescheduled or reimbursed. If you’ve missed a lesson, you can ask the teacher if they can meet you 5 minutes before the next lesson to answer any questions you might have about the notes of the lesson you missed. If you require more flexibility, we recommend booking a private one-on-one course, that way, you can custom schedule your lessons with the teacher. FAQ - How long does it take before you're ready to take the Sproochentest, the language exam to acquire Luxembourgish nationality? All our courses are laid out in such a way so as to maximize your time in order to pass the nationality exam if that is your aim. There's four courses: A1 Basics, A1 Conversation, A2.1 Conversation and A2.2 Conversation. Most people are ready to take the exam after that, if not, we supplement with private lessons. Based on my experience, a year to two years is a reasonable time frame to expect in order to be able to pass the nationality exam. We've seen shorter than that, and we've seen longer than that, but two years seems to be the average of time that passes between the start of studies and the passing of the language exam for Luxembourg citizenship. After the four courses we have developed, a lot of people have achieved the A2 / B1 levels required in order to pass the nationality test. However, there's no guarantee as everyone is different. It depends on how much you'll be able to study and practise your speaking outside of the lessons, too. This A1 Basics course is your first step in getting ready to take the exam. FAQ - What if you change your mind and want to cancel your lessons? There is a 50€ non-refundable deposit on this A1 Basics class in order to reserve your spot. Cancellations are accepted until immediately after the first lesson. Timing of current classes not quite right? Want to organize private classes? Not sure about your level? Get in touch!